As Rotary celebrates the 100th Anniversary of The Rotary Foundation, congratulations go to District 5040 Governor Lyn Stroshin and Alex Stroshin for their induction into The Rotary Foundation's Arch Klumph Society on April 12, 2017 at Rotary Headquarters in Evanston, IL. RI President John Germ (left) and Trustee Chair & Past RI President Kalyan Banerjee (right) presented the prestigious recognition. 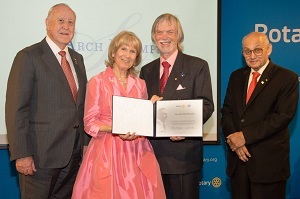 A special thank you to them and 13 other dedicated and committed Rotary couples who have recently made a significant financial contribution to the humanitarian programs of The Rotary Foundation and have been inducted to the Arch Klumpf Society (AKS). 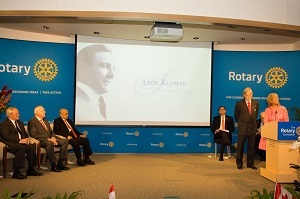 Each new AKS inductee spoke passionately about why they support The Rotary Foundation. DG Lyn described the impact on her and Alex of their polio immunization trip to Ethiopia. On left, DG Lyn Stroshin, with Alex, speaking to international Rotary leaders and fellow Arch Klumpf Society inductees at the April 12, 2017 induction ceremony. 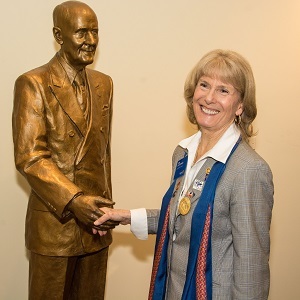 In the background is an image of Arch Klumpf, who led with others, 100 years ago, the founding of The Rotary Foundation. 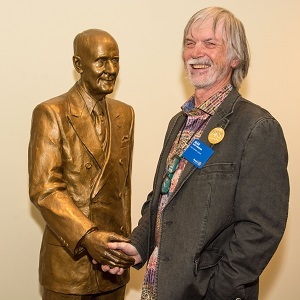 The new inductees shake hands with Rotary founder Paul Harris at Rotary International HQ in Evanston IL. With the induction of the Stroshins there are now five (couples) Arch Klumph Society (AKS) members in District 5040.